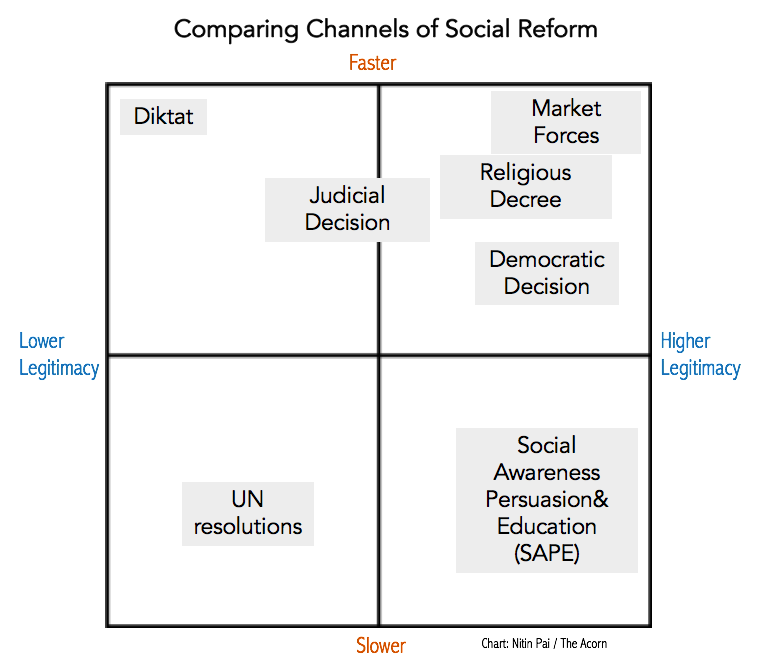 Here’s a chart that compares various ways social change can be attempted. In the light of contemporary public debates on a number of issues — most of which land up in the Supreme Court — it is appropriate to examine the menu of options and the trade-offs in using them. What causes corruption and erosion of moral values? 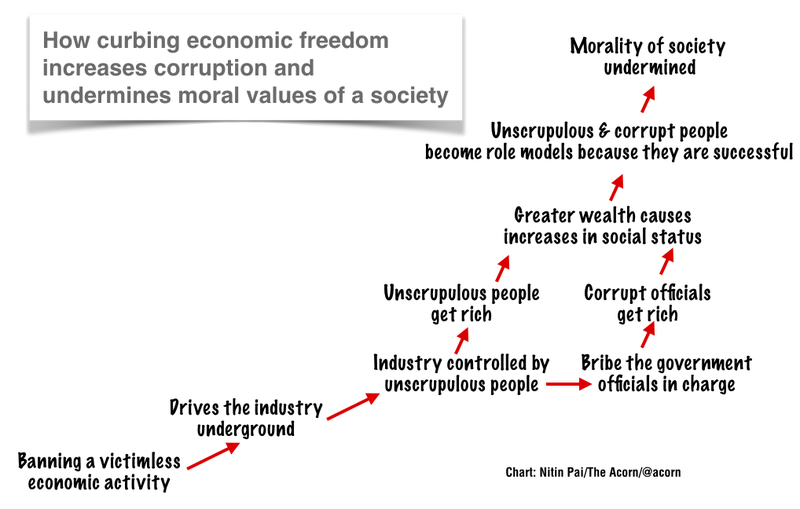 An illustration showing how government interference in economic activity increases corruption, crime and leads to the moral degradation of society. Although the chart only refers to bans, it also applies to lesser interventions like price caps, price floors, excessive tariffs, quotas, reservations and so on. The difference is one of degree. Author Nitin PaiPosted on 29th January 2014 29th January 2014 Categories Economy, Public PolicyTags corruption, economic reasoning, morality1 Comment on What causes corruption and erosion of moral values? Alleviating poverty requires economic growth alone. It is not often that Indian public discourse seriously discusses big ideas. So it was nice to see, a few days ago, a debate in large sections of the mainstream and social media on economic growth vs redistribution. This debate received wider public attention because it was conflated with a personality clash between Jagdish Bhagwati and Amartya Sen, because it became entangled with the hottest political topic of our times and because it came at a time when the issue itself is important. When faced with two sharply different points of view, it is common—not least in India—to insist that the truth lies somewhere in the middle. This is celebrated as being reasonable, as representing the compromise that is the hallmark of democratic practice and as being the mystic middle path. So when some economists insist that growth is the best way out of poverty while other champion redistribution of wealth, it is to be expected that there will be reasonable people who will say “we need both more growth and more redistribution”. This is a good way to end the debate amicably and drink to reasonability and democratic compromise. Unfortunately, there’s a difference between appearing reasonable and being right. “We need more growth and more redistribution” is not a reasonable middle position. It is essentially an argument for redistribution but stated in a different form. Without growth, redistribution is at best a transfer and at worst, theft. If a community earns the same amount of money (or produces goods of the same value) every year, then redistribution takes from Preetam to pay Palani. If Preetam consents to the arrangement, it is a transfer. If he doesn’t, it is theft. Over a period of time, it will make the community more equal, but it doesn’t necessarily make the community less poor, for even after achieving income equality, the average income can be below what is required to subsist. Growth is the only way to increase the overall income of a community. It can raise the respective incomes of both Preetam and Palani, although Preetam’s income might rise faster than Palani’s. Inequality will rise in such a community—perhaps because Preetam was born into a better endowed family, perhaps because Preetam works harder or perhaps because Palani faces greater social hurdles—but because both Preetam’s and Palani’s incomes rise, the whole community can climb out of poverty. There is vast empirical evidence for this, and growth is the best antidote to poverty. It’s the most effective anti-poverty scheme known to humankind. Here’s the best thing: in such a society, there is no inherent need to take from Preetam to pay Palani on the grounds of poverty alleviation. There might be other issues—for instance, progressive taxation to finance public goods based on the ability to pay, but not to help a poor Palani out of poverty. Hey, wait a minute! Isn’t inequality rising? Isn’t that a bad thing? Aren’t Palani’s prospects not handicapped by historical social hurdles? Aren’t Preetam’s disproportionate gains coming from exploiting Palani? The reasonable people who argue that “we need both more growth and more distribution” usually raise these questions to argue for more redistribution. (There are unreasonable people who raise these questions for other reasons, but let’s stick with responding to the reasonable). Yes, inequality will rise, especially during periods of high growth. But inequality is a social problem only if it is permanent and ossified. However, growth is the best way to ensure that it is not—with growth comes mobility, and the expectation that one can improve one’s life allows societies to thrive despite the inequalities. Ask migrants to New York or Mumbai. Many also see a moral problem with inequality, but why expect the state to solve moral problems? Let the moral conscience of society address its moral problems. Shouldn’t we account for historical social hurdles that hobble some citizens? Yes, but these are addressed by creating equality of opportunity, not by insisting on equality of outcomes (where Preetam and Palani end up earning the same income). You can achieve equality of opportunity without redistribution—affirmative action and reservations (without subsidies) are ways to address this challenge. Isn’t Preetam exploiting Palani? This blog post will not attempt a comprehensive critique of Marxist thought. However, the ideas of economic freedom, property rights, voluntary exchange and comparative advantage together prove that Preetam’s gain is not at Palani’s cost. Although the sort of people who argue that Preetam exploits Palani will seldom acknowledge that redistribution, by definition, means that Palani’s gains come at Preetam’s cost. Unlike redistribution, growth creates non-zero-sum or win-win situations. Only growth creates such situations. From this alone, we should conclude that “we need growth, not redistribution”. But reasonable people will go to great extents to be reasonable. It’s about sequencing, they’ll say, and contend that some redistribution is necessary for growth. It’s unclear why this is called a reasonable argument—if we accept that both Preetam and Palani will be better off with growth, then the decision to take some from one and give it to the other is unnecessary, whimsical and entirely arbitrary. Instead, why not spend extra effort to ensure that there are no constraints to growth in areas that benefit Palani? Ergo, what appears reasonable is not quite reasonable: we need growth, not redistribution. The state can ensure growth by getting out of the way of private enterprise, ensuring public goods are provided, acting as an impartial referee, ensuring equality of opportunity and a level playing field. Governments are not good at redistribution: it involves taking money from people who don’t want to give it up and passing it through a system where everyone wants to grab as much as they can get. That is why redistribution is attractive to politicians who are keen to listen to intellectuals who say it is necessary. When Wikileaks indiscriminately leaked diplomatic correspondence it had the fig leaf of claiming it was exposing wrongdoing by governments. Never mind that it put the lives and safety of informants in authoritarian countries at risk while only revealing details of how international diplomacy is conducted. Those details might have surprised ordinary people who were unfamiliar with the workings of their foreign ministries and embassies, they didn’t achieve any lofty public purpose. As I argued then, they might have conversely caused governments to tighten up their information silos to the detriment of the public interest. Now, when Wikileaks has indiscriminately leaked the email archives of a private firm, Stratfor, there is no fig leaf of any kind left. Stratfor is a private intelligence company that collects and sells geopolitical analysis to private and government buyers. The nature of its business requires it to seek out informants, negotiate with them and pay them. It might procure leads from US government agencies and sell them information. All this is in the nature of its business. Some people might be appalled that other people do this kind of business, but it is a legitimate business. Stratfor didn’t claim to be the Red Cross or a humanitarian organisation. It claims to be “a subscription-based provider of geopolitical analysis…(using) a unique, intelligence-based approach to gathering information via rigorous open-source monitoring and a global network of human sources.” It is what it says it is. It operates legally. If Julian Assange or anyone else knows of specific instances of wrongdoing or illegal activity by Stratfor or its employees, the right thing to do is register a complaint with the relevant law-enforcement authorities. If Mr Assange has evidence of illegality, the only ethical thing for him to do is to hand it over to the authorities. Wholesale, indiscriminate leaking of private information—because you dislike Stratfor’s business or suspect illegality—is neither ethical nor moral. It is quite likely illegal. From what we know of Julian Assange, he lacks the moral compass to make these fairly obvious ethical judgements. The Hindu, though, does (or, perhaps, used to). I often disagree with the newspaper’s editorial line. However, until the Indian newspaper’s dalliance with Wikileaks, I did not have reason to complain about its basic ethics. No longer. It is unclear just how a reputed institution like The Hindu could be a willing collaborator with Mr Assange on the violation of the privacy of a private company. If the editors of The Hindu believe that invading Stratfor’s privacy is somehow acceptable then they ought to start by opening up their own corporate email systems to the public. Make every email and phone call public. Surely the public has a right to know the names of the informants who talk to the newspaper’s journalists? Surely the public must know what the journalists tell each other and to their editors? So what if the informants are honest whistleblowers risking their lives or crafty officials manipulating public opinion? Let’s have it. Let the people decide! If The Hindu’s editors think that their own emails are private information, why then are they denying that right to Stratfor? This is sophistry. The ethical question here is how can we know a priori that there is wrongdoing? Is it ethical for individuals and newspapers to steal private property (or deal with thieves) merely on suspicion? Even the police can’t search without warrant. So if I suspect The Hindu of being on the payroll of the Chinese Communist Party, it it acceptable for me to hack into their email systems, or ransack their offices, to look for evidence of “wrongdoing or unethical behavior”? Clearly not. If this proposal strikes you as preposterous, it is because it is. Strangely, and unfortunately, The Hindu’s editors are doing just this to someone else. Yan Xuetong is one of China’s finest minds on international relations. His recent volume, Ancient Chinese Thought, Modern Chinese Power is an excellent introduction to the schools of political philosophy in the Chinese civilisation. His op-ed in the New York Times today presents his view on the essence (if at all an essence can be distilled from diverse, rich strands of wisdom) of what ancient Chinese thinking might mean for contemporary geopolitics. According to the ancient Chinese philosopher Xunzi, there were three types of leadership: humane authority, hegemony and tyranny. Humane authority won the hearts and minds of the people at home and abroad. Tyranny — based on military force — inevitably created enemies. Hegemonic powers lay in between: they did not cheat the people at home or cheat allies abroad. But they were frequently indifferent to moral concerns and often used violence against non-allies. The philosophers generally agreed that humane authority would win in any competition with hegemony or tyranny. How, then, can China win people’s hearts across the world? According to ancient Chinese philosophers, it must start at home. Humane authority begins by creating a desirable model at home that inspires people abroad. Mr Yan argues that China must display humane authority abroad by developing better relations with other countries than the United States does. China must protect weaker states and strengthen regional security arrangements like the Shanghai Cooperation Organisation. He calls for China to be open to foreigners and attract talented immigrants. This is the way, he says, China can defeat the United States—not through hot or cold wars, but through strategic competition. There’s much to recommend Mr Yan’s vision of China’s role in the world, not least because it might be a better template for Beijing’s foreign policy than whatever is on offer today. However, Mr Yan’s conceptualisation of humane authority being the route to global hegemony has two fundamental problems. First, nations of the world resist the idea of an external authority, humane or otherwise. This resistance grows when the said authority is illiberal and inequitable. It is unlikely that nations that have tasted freedom, or are yearning for it, would willingly accept authoritarianism even of the humane variety. The best that can be said is that China’s civilisational ethos makes its people accepting of authoritarianism, but a look at Taiwan and Hong Kong suggests otherwise. If people value liberty more than whatever domestic or hegemonic humane authority offers them, then China is unlikely to gain influence. Mr Yan might be betraying the Middle Kingdom mindset, implying that “what Chinese people consider good, everyone else ought to consider good”. Second, if China interprets ‘humane authority’ as discarding the Middle Kingdom mindset and accepting liberalism, plurality and diversity, then it might be indistinguishable from the United States. What then would be China’s competitive advantage vis-a-vis its primary rival? To defeat the United States, China will have to become more like the United States. If it becomes more like the United States, would it be a victory for China at all? Traditional Chinese political philosophy is at its weakest when analysing a diverse, heterogenous world with multiple sovereignties. As Mr Yan’s arguments show, it finds it hard to reconcile values, beliefs and behaviours that are just different. In ancient China, people who didn’t subscribe to the norms were termed “barbarians”, to be kept out using great walls, kept away through diplomacy or subdued by military force. Chinese strategy has the unenviable task of dealing with a modern world that is full of such ‘barbarians’. Related posts: On the Middle Kingdom mindset; and how it interacts with India’s geopolitical worldview. The concept of dandaniti, variously translated as the science of punishment, the science of chastisement, and in Dr Shamasastry’s translation, even as the science of government may be better understood to be the imposition of the rule of law. Dandaniti is central to Rajdharma—the morality of governance—and is discussed at length in the Shanti Parva of the Mahabharata. In the Arthashastra, Kautilya suggests why and how the rule of law ought to be applied. That sceptre on which the well-being and progress of the sciences of Anvikshaki, the triple Vedas, and Varta depend is known as Danda (punishment). That which treats of Danda is the law of punishment or science of government (dandaniti). It is a means to make acquisitions, to keep them secure, to improve them, and to distribute among the deserved the profits of improvement. It is on this science of government that the course of the progress of the world depends. “No,” says Kautilya; for whoever imposes severe punishment becomes repulsive to the people; while he who awards mild punishment becomes contemptible. But whoever imposes punishment as deserved becomes respectable. For punishment (danda) when awarded with due consideration, makes the people devoted to righteousness and to works productive of wealth and enjoyment; while punishment, when ill-awarded under the influence of greed and anger or owing to ignorance, excites fury even among hermits and ascetics dwelling in forests, not to speak of householders. In other words, Kautilya eschews a harsh imposition of punishments in favour of their measured but efficient use. Now it is not known whether Ravikiran Rao referred to fourth chapter of Book I of the Arthashastra but his article on counter-terrorism policy in this month’s Pragati but some of his arguments reflect the Kautilyan view—especially the need to have a co-operative citizenry. Beyond terrorism, there is abundant evidence that the modern Indian state is failing in its practice of dandaniti. In this week’s Economic & Political Weekly, Andre Béteille has an excellent essay on constitutional morality in India, where he says that the people of India “are destined to oscillate endlessly between the two poles of constitutionalism and populism without discarding the one or the other”. When even the chiefs of India’s famously disciplined armed forces brazenly disobey orders issued by constitutional authority, and internal security is almost entirely cast in the framework of competitive communalism, you know that the pendulum is well into the populism phase. A swing back towards constitutionalism is way overdue. Even if Prof Béteille is right and endless oscillations are destiny, the modern day dandaniti should aim to keep their amplitudes small. Related Links: The reading the Arthashastra series archive. There are good reasons to carry the Olympic torch. Aamir Khan gave the worst one. Aamir Khan, it has been reported, has turned down pleas by Tibetan refugees, fans, friends and some members of his family not to carry the Olympic torch on its Indian leg on April 17th. His decision is in sharp contrast to that of Baichung Bhutia, the Indian football captain. Mr Bhutia pulled out of the programme as a personal protest against the China’s handling of the protests in Tibet. It is not at all surprising that Mr Bhutia’s decision was hailed as heroic, and Mr Khan’s criticised. Indeed, if Mr Khan had only justified his decision based on the need for an Indian citizen to respect the Olympic spirit on the grounds that the Olympics ought to transcend politics, like Kiran Bedi did, his decision too would have been praiseworthy. It would have invoked the Longbottom principle. Unfortunately, Mr Khan went on to justify his decision by belittling his own country. As B Raman writes in an open letter to Mr Khan, and as The Acorn pointed out when M K Bhadrakumar made a similar argument a few days ago, it takes a particular form of moral deficiency to equate China and India and the way they deal with disaffected citizens. There can only be contempt for those who draw this specious analogy and hide behind the I-am-against-any-form-of-violence amoral pacifism. That Aamir Khan made this comparison should disqualify him from carrying the torch on behalf of India. The torch should be carried by those who are proud of the values that India stands for. Shame on you, Mr Khan. Update: Aamir Khan is carrying the torch on behalf of the Coca Cola Company, and not a representative of India. The difference is important. It is a decision between him and his corporate sponsor. Given his repugnant perception of his own country’s values, it should only be a good thing that he is not “officially” representing India. But this does not mean that his comments are any less excusable.